A series of 18 digitally printed artwork panels of 70 x 400cm each were created by Textile Artist , Ptolemy Mann to reflect the theme of 'SEA, SKY, FOREST, SUN' through an abstract textile language. Enabling the space to be divided up throughout the day to suit specific needs of visitors this has become a space of refuge within a dynamic, busy, city hospital. 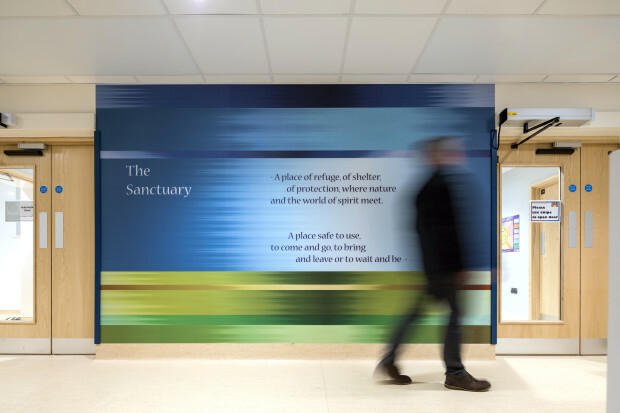 The Sanctuary area in a busy hospital has to be hard-working to balance the needs of different groups, communities, faiths, visitors, staff and patients. There are both practical and emotional considerations to take into account for any artist working in this context. A new kind of space needed to be created, one that was very contemporary in feel, spoke of quality and care and that made everyone feel welcome. Some faith groups require separate spaces for men and women to congregate, alternatively, a person of no faith might be seeking a moment of privacy and refuge. 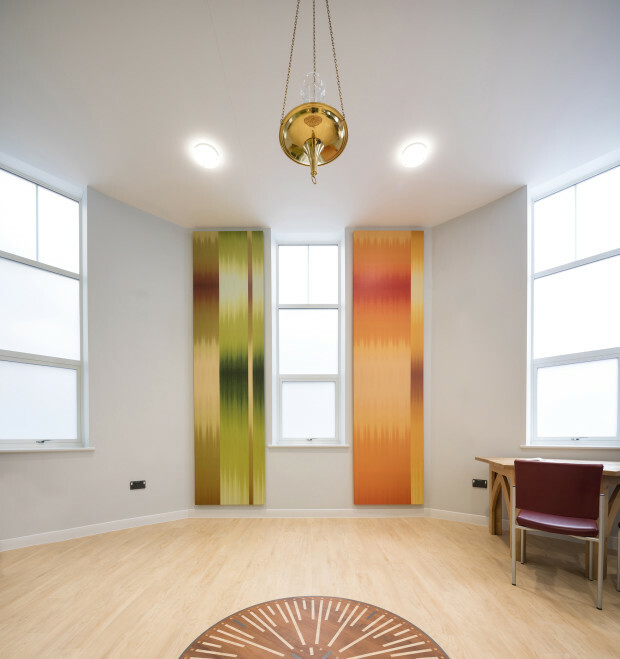 It was identified that the room needed to be suitable for the widest possible group of patients, visitors and staff, to enable moments of individual privacy as well as group gatherings, to be inclusive without becoming bland and to feel totally different to the clinical spaces in the hospital. 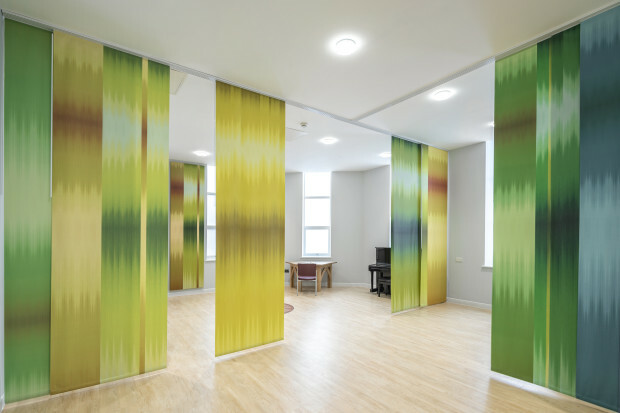 Ptolemy’s approach to the project included historical references to woven artworks in contemplative spaces, an appreciation of the ability of soft, acoustically-absorbent fabric installations to create the required distinctive, calm space within the busy hospital and a desire to use a sophisticated colour palette, that might evoke a connection with nature. 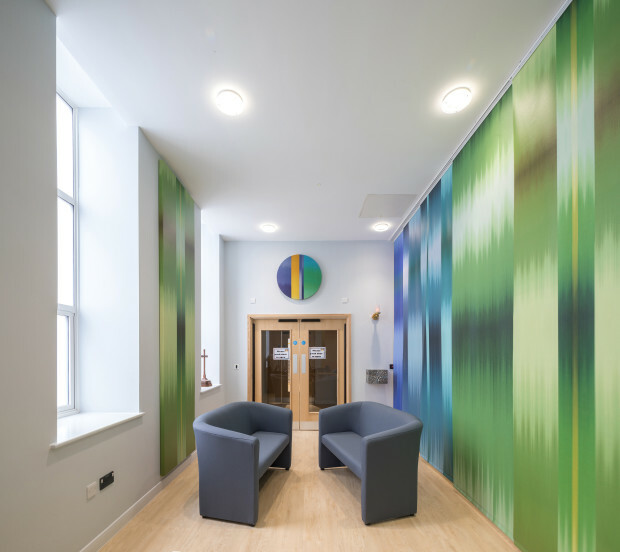 Collaborating with Art Consultants Willis Newson and drawing upon their experience of surface design in healthcare settings, Mann proposed using digitally printed lengths of robust, fire resistant and wipeable fabric to create the artwork panels which would both be static and mounted within a flexible Panel Glide track system within the ceiling. This offered a more elegant, easy-to-use and practical solution to floor based screens, as used in many hospital sanctuary spaces. Although digitally printed these panels were created directly from scans of hand dyed and woven artworks; this digital translation of the hand-made enables the artists hand to be visible. Two elegant circular artworks – which were painstakingly hand dyed and woven - are visible above the door ways - showing both techniques in harmony within the space. 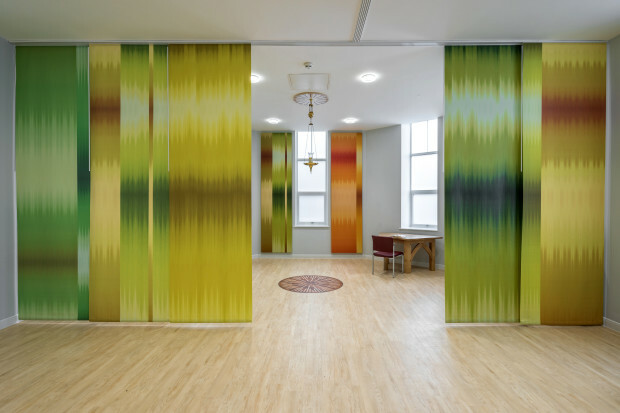 “Superstar weaver” and colour consultant Ptolemy Mann has collaborated with leading arts & health consultants Willis Newson to create a beautiful, innovative and transformable artwork installation for Bristol Royal Infirmary’s new Sanctuary space. 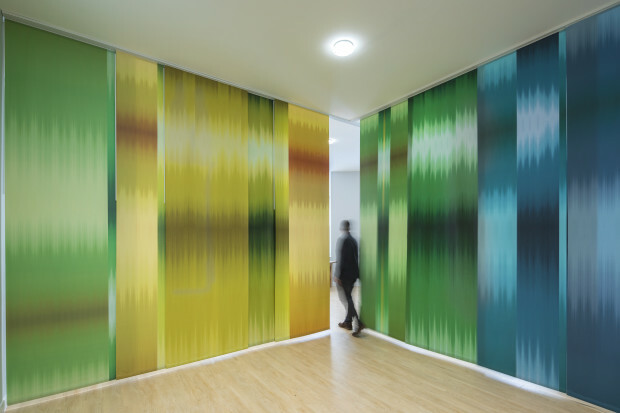 Ptolemy Mann creates architectural, geometric and sophisticated wall based art for public and private clients. Referencing the ancient weaving technique called Ikat which involves her hand dying fine cotton yarn to create delicately gradated coloured warp threads Mann is able to bring bold linear blocks of colour together with more delicate areas that gently merge and blend to create her signature style.